Today in Masonic History Benjamin Travis Laney, Jr. is born in 1896. Benjamin Travis Laney, Jr. was an American politician. Laney was born on Novmeber 25th, 1896 in Camden, Arkansas. He attended the local public school, although never graduated from high school. Despite lacking a high school diploma, he was admitted to Hendrix College, a liberal arts school in Arkansas. His studies there were cut short when he enlisted during World War I in the United States Navy. He served from 1918 until the end of the war. After the war he returned to college this time to Arkansas Teachers College, now known as the University of Central Arkansas, where he earned a degree in 1924. He also took graduate courses from the University of Utah in Salt Lake City. Laney owned a variety of businesses including a drug store, a real estate business, and had interests in cotton gins, feed, and banking. He also discovered oil on his land. Because of his varying businesses he was nicknamed "Business Ben." In 1935, Laney was elected Mayor of Camden. He served until 1939. 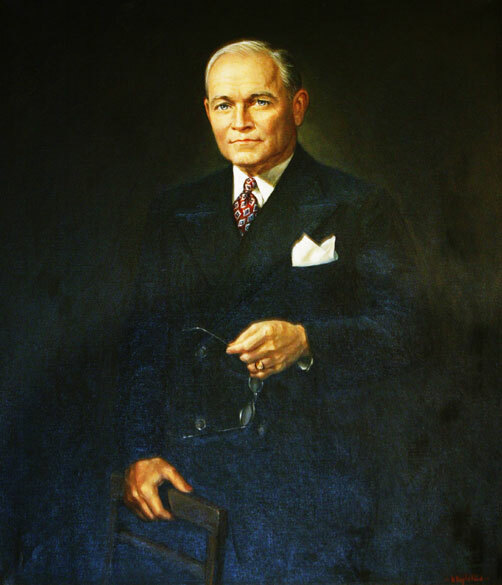 In 1944, Laney successfully ran for the office of Governor of the state of Arkansas. Laney, a Democrat, defeated his Republican opponent with 86% of the vote. He would successfully win a second term in 1946. During Laney's term a Public Utilities Commission was formed and funds were appropriated to build a stadium in Little Rock. Plans were also made to build an official governors mansion. In 1948, Laney did not see reelection. He attempted, unsuccessfully, to be reelected in 1950 with the campaign slogan of "Reelect Ben Laney for Governor, For a Second Time." This was despite of the fact that it would have been his third term in office. It was also in 1948, that Laney was asked to be the Dixiecrat nominee for President. The Dixicrats were a short lived part of segragationalists. Laney initially refused the request. He then decided to attend the convention in Alabama. After arriving he refused to attend the convention and Strom Thrumond, the then Governor of South Carolina recieved the nomination. Laney was a delegate to the 1969 Arkansas Constitutional Convention. Laney passed away on January 21st, 1977. Laney was a member of Garland Lodge No. 354 in Elliott, Arkansas. He addressed his lodge in 1943 giving a speech on "The duties a Mason owes his Lodge."